Rope Climbs...might just save your life! When I was a kid in school, I used to love Rope Climb day. I remember getting in trouble for going all the way to the ceiling in our high school gymnasium instead of stopping at the line. Explaining to the coach that there was no way I was going to let go after going that high didn’t get me out of running laps the rest of class. The Rope Climb is an incredible skill to practice, and ultimately achieve. It will help you develop general upper body strength, including your grip and core strength. Practicing the Rope Climb as a skill and eventually being able to climb the rope goes beyond just developing a new fitness skill, it could just save your life. Now, I’m not telling you to start planning for an adventure in a skyscraper with The Rock, however, if you are going to work on something that will improve your strength, the fact that this skill could save your life, is a great fringe benefit. Nobody ever hopes they are in a situation where hanging onto and climbing a rope could be the difference between life and death, however, surviving a situation because you had the strength to do it beats landing a shark any day! Today, we are going to be working on Rope Climbs as a skill, then, we are going to add them into a Hero WOD called “White”. 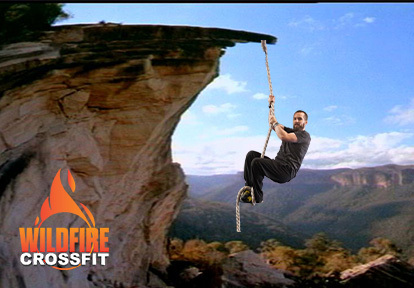 So, get into WildFire CrossFit to work on your rope climbs today….it could just save your life! !